My family spent the Christmas holiday visiting friends and relatives in the UK. 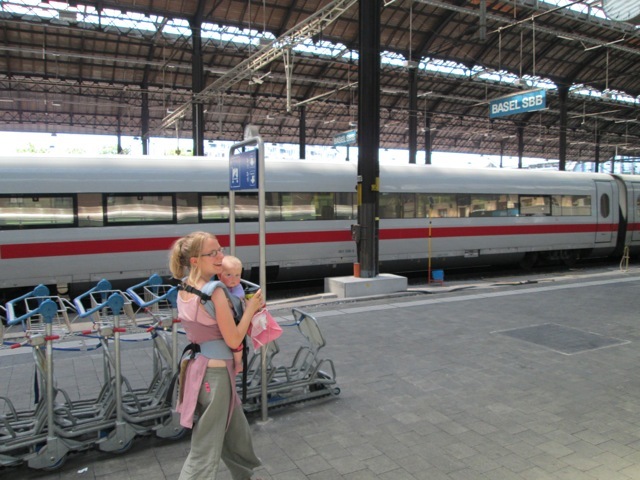 We were all ill, and the travel combined with exhaustion meant that I didn’t spend much quality time connecting with my 16-month-old daughter. But I’d also learnt through Hand in Hand Parenting is that ‘off-track’ behaviour is a sign that a child feels disconnected from us. It is their way of telling us, ‘’I need connection!’’ From this perspective our children are naturally, good, loving and co-operative, it’s just that sometimes, upset feelings, can get in the way of their feeling our warmth and love. I knew that reconnecting with my daughter would help improve things, but I was still feeling exhausted and recovering from being ill. The first thing I did was to call my listening partner. A listening partnership is a free scheme where two parents exchange listening time with each other. They don’t offer advice, tell their own stories, or try to fix things. The idea is, that when someone truly listens to us in a warm and supportive way, without interrupting to “help,” then we can release our negative feelings. Anger, stress, and exhaustion all evaporate when we can really talk to someone about how we are feeling. I’m always amazed that often just ten minutes of listening can restore my energy, enthusiasm, and patience for being with my daughter. That morning while I was putting on my sock, I pretended to struggle with it, and then ‘pinged’ it across the room and acted surprised. My daughter laughed a lot at this so I repeated it. I kept struggling to put on various items of clothing and she kept laughing. Then I started to walk and fell over again and again over. My daughter found this hilarious. I tried to hang some washing up, and kept saying, ‘’Oh no!’’ as it repeatedly fell down. Then we were playing on my bed, and my daughter would laugh gleefully as she threw some clothes off the bed, and I would keep trying to retrieve them, only to have her throw them off again. At naptime, I chased her around the house, and she kept laughing as she managed to “escape” me! Understanding what makes our children laugh is a hit and miss thing, and sometimes my attempts would fall flat, but I kept trying, using my intuition, to see what would work. We had a really laughter packed morning, as if we were making up for all the playlistening missed while we were on holiday. When she took her nap, she fell asleep much more easily than normal. I was also feeling much more relaxed. After this morning my connection my daughter was much better. She stopped fighting me about everyday things. She happily went in her buggy, and let me change her nappy without a fuss. More than once, behavior that I thought was difficult and “toddler-like” has actually turned out to be just a period of disconnection that we overcame by using the Parenting by Connection tools. Traveling as a family can be fun and exciting; it’s a wonderful opportunity to spend quality time together and get really connected. But it can be stressful, especially when things don’t go exactly to plan. When we are busy rushing to catch planes or trains, routines get upset, and emotions run high. As parents, we try so hard to make happy memories for our children, and it can be frustrating when we spend our holiday time dealing with our children’s off-track behaviour and tantrums. These days when I travel I’m sure to factor in connection time on the road, so we don’t arrive home exhausted and disconnected! Here are a few tips based on the Parenting by Connection listening tools, to help make your travels go more smoothly. Did you know that there are mirror neurons in the brain that recreate our emotional states in the brains of those around us? Children can pick up on our stress, so if we are relaxed and happy then it’s likely they will be too. Sometimes going back home to visit friends and family can evoke strong emotions in us. Having someone that we can talk to who doesn’t offer us advice, but simply listens can help us to release the feelings that get in the way of us enjoying our travels. On a practical level, try to save plenty of time for packing and getting organized so it isn’t a last minute rush to the airport. Spending one-on-one time with your child, following their lead, is a wonderful way to connect. For a time period such as 10 or 20 minutes, tell your child they can do anything they choose (as long as it’s not dangerous!) while you simply delight in their presence, giving them lots of eye contact and affection. For your child, it’s the perfect antidote to rushing around according to mum and dad’s schedule. When you are waiting around at the train station or airport, why not tell your child it’s special time, and let them set the pace for a while? It can turn boring moments into a fun adventure that you share with your child, making everyone feel more relaxed and connected. If you are staying with relatives, then special time with your child can help her feel well connected to you even during busy times with other people. Finding ways to laugh along the journey can help everyone stay relaxed. A game of peek-a-boo with a toddler in a backpack, or even a mini pillow flight on an aeroplane, turns getting from A to B into a game filled with fun and laughter. Recently, when I took a plane flight, I put a blanket over me, and said ‘’I hope no-one tries to pull my blanket off,’ cue my daughter delighting and giggling as she repeatedly threw my blanket on the floor, and I had to put it back on. Setting up these pretend power struggles, helps our children co-operate more easily with us when we really need them to. It can be disheartening when we do everything we can to create happy times for our child, and they end up crying or having a tantrum about something that seems small and insignificant. When our children get upset about something small, they are more than likely expressing upset feelings about a bigger issue, or perhaps about an accumulation of upset feelings from times that were more difficult. Crying is not just for babies. It’s a healing process for older children, and adults too. Tears contain cortisol the stress hormone, and other toxins are released in tears, so when we cry, we are literally releasing stress and becoming more emotionally balanced. If your children do get upset about something, it’s helpful to simply give them your full attention and listen, without trying to distract them or tell them to stop. Often when a child has finished crying, they will be in a much better mood, having shed some emotional baggage. When children feel well-connected to us, such as on holiday or after having a long family outing, then they often cry easily because they sense our availability to listen. It’s not that they are ungrateful for all the effort we’ve gone to make sure they have fun. Rather, they cry more readily because they feel secure enough to release their feelings. Listening to crying children is not always easy! This is where listening partnerships come in again. Releasing our own feelings about how hard it is when our children cry gives us the renewed patience to listen. When our children cry, it doesn’t mean we’ve failed as a parent. On the contrary, they feel safe and loved enough to show us how they feel. I hope these tips help you to make your travels as fun as possible. Happy Travels! You can find out more about the Hand in Hand listening tools in this intro here.